Classicstone is exactly what it suggests, the ultimate in timeless, traditional flagstones. Each hand cut piece has a naturally riven surface and edges that inspires a warm and natural olde worlde look. Available in a variety of sizes, circles fashion interesting features and create focal points in larger spaces. 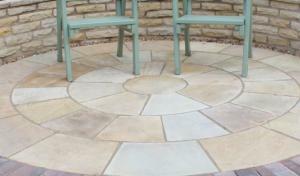 The circle kits are available in most of the sandstone colours within the Classicstone range including Golden Fossil, Harvest, Lakeland, Promenade and Heather.